Every year, hundreds of women at Nottingham University Hospitals use a birthing pool during their labour. The benefits are well-documented. Being in the water is a very effective form of pain relief and can help with relaxation, so we are delighted to have opened two new pools in our labour suite – meaning even more women will be able to try a pool during their labour. 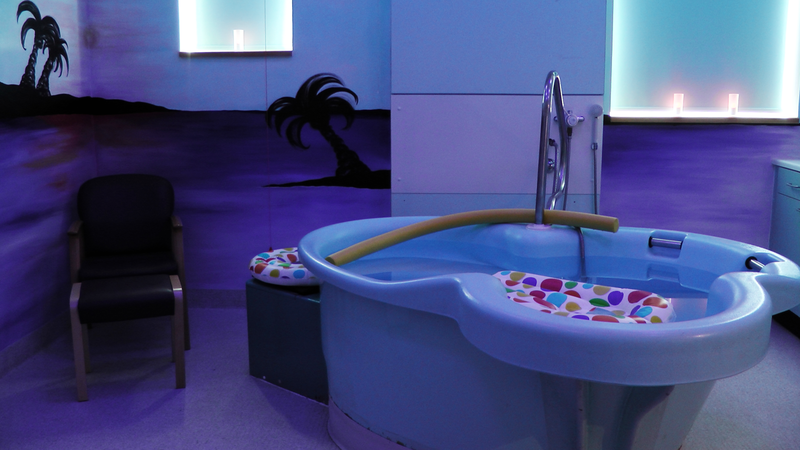 One of the pools is on the consultant-led side of our labour suite, which is a first for us. It means women who may previously not have been able to use a birthing pool are now getting this opportunity. This might be women with a long–term health condition, or perhaps someone who has had problems during a previous labour. It may be that some women won’t actually give birth in the pool, but will use it in the early stages of labour to help relieve some of their discomfort. Last year more than 250 women used a pool at some stage of their labour at QMC, and the new pools mean that this figure will continue growing. Women who have used a birthing pool generally tell us they have had a positive labour experience, and water is recommended by the Royal College of Midwives which states there are “considerable perceived benefits of using immersion in water during labour”. This includes not only relaxation and pain-relief, but it’s also much easier to move around in the water, without the pressures of gravity, which means women are able to get in the best birthing positions. This can result in a quicker labour – meaning less need for the use of drugs, whether that’s for pain relief or to speed things along. This obviously means fewer side effects for mum and baby. It is particularly effective when used in conjunction with aromatherapy – another service we are able to offer to many women that come in to our labour suite. My role is all about helping to ensure that women have the best possible birthing experience and, while water is not for everyone, it is great to be able to offer more choice to more women.